Supports all non-External Probe and Humidity products. The LogTag® Protective Enclosure is specifically designed for use with LogTag® Logger products and allows LogTags® to be used in harsh environments. The design of the enclosure minimises the effects of thermal lag caused by the additional casing. In general, the enclosure adds about 70% to the reaction time to temperature change in the same environment. 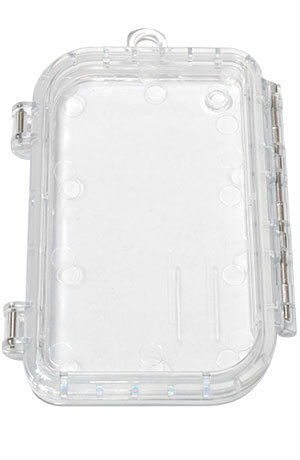 The enclosure’s case is made from high impact polycarbonate plastic and is clear to allow viewing of the enclosed logger’s LCD or indicators. LogTag® Models Supported Supports all non-External Probe and Humidity products. Chemical resistance In general the polycarbonate material can withstand alcohols and diluted acids well. Problems can occur with hydrocarbons, phenols, esters, ketones and alkalis especially at elevated temperatures. T90 thermal performance With TRIX-8 in 1 m/s air: T90 = to 10 minutes.